MOLA map showing general topography near the area of the images below. The tiny black rectangle near center is the approximate area of the full-size image. 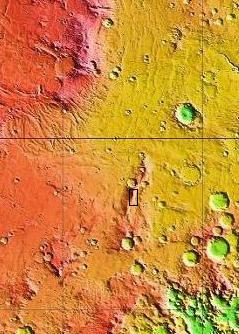 Below, an area about 15 by 30 miles in size imaged by the Mars Reconnaissance Orbiter as the first test of the High Resolution Imaging Science Experiment, or HiRISE. The image is centered at 33.65 degrees south latitude and 54.93 degrees west longitude, as shown in the map above. North is 7 degrees to the left of vertical. The area imaged -- a portion of the eastern Bosporos Planum region, which shows considerable alteration of ancient cratered landscapes by later volcanic and erosional processes -- shows a variety of geological processes. Ancient and younger craters are scattered across a rolling landscape, while ancient stream valleys flank a gently sloping ridge probably formed by thrust faulting that runs more or less vertically through the image. 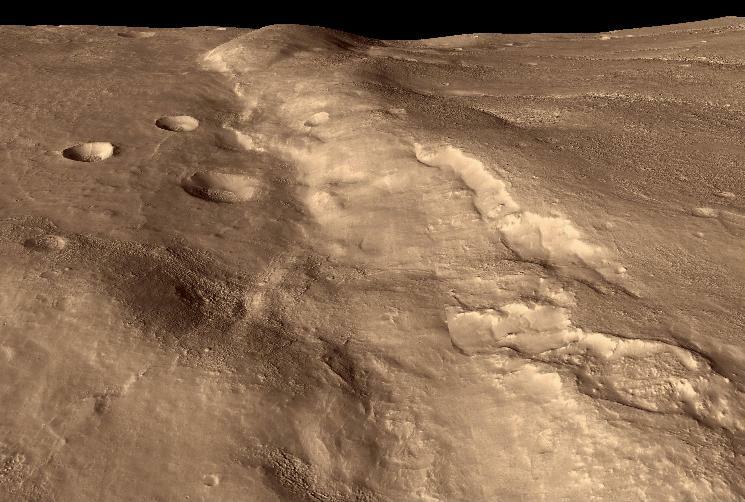 Most of the region is covered with layers of wind-blown sediment, so only the younger craters retain sharp edges, and wind erosion and sublimation of carbon dioxide ice has created irregular, partially eroded patches in many areas. Sand dunes, still forming and reforming as a result of winds, are found in many stream beds and craters. The colors in this image are (as is normal for most astronomical images) "false" colors. Black and white infrared, green and red images were combined using arbitrary colors to emphasize details and differences in composition and reflectance. The brighter bluer regions in the southern (bottom) portion of the image are possibly due to early-morning fog, while darker and lighter reddish deposits near craters are presumably material ejected during the craters' formation. The greenish areas near the center seem to have unusual reflective properties, and may be targeted later by an imaging spectrometer, to estimate the areas' mineral composition. The image presented here is only 8% as wide and high as the original image, so far more detail is visible in the original. As the orbit of the Reconnaissance Orbiter is gradually reduced in size by aerobraking, resolution should increase by another 25 times, so details as much as 300 times smaller than the smallest objects visible in this image will be revealed. Taking full advantage of such incredibly detailed images will require enormous amounts of time and effort, so only small portions of the surface will be imaged in such detail. Most of the surface will be mapped at resolutions similar to those shown here, in an effort to identify the most promising areas to be studied at greater resolution. Below, a 3-dimensional image of a portion of the above image, created by using variations in shading to estimate relative heights. The image above was taken at a fairly low Sun angle, so areas tilted one way or the other are brighter or darker. Comparisons of relative heights estimated in this way show good agreement with earlier MOLA measurements obtained using laser altimeters, so the image is probably a fairly good representation of the topography. Unlike most 3-dimensional images of planetary surface features, there is no vertical exaggeration of the features shown below.